In November 2014 I bought a Greenland paddle. I had been curious for quite a while, and inspired in particular by the Swedish kayak designer Björn Thomasson, see www.thomassondesign.com (lots of info in Swedish and some in English). 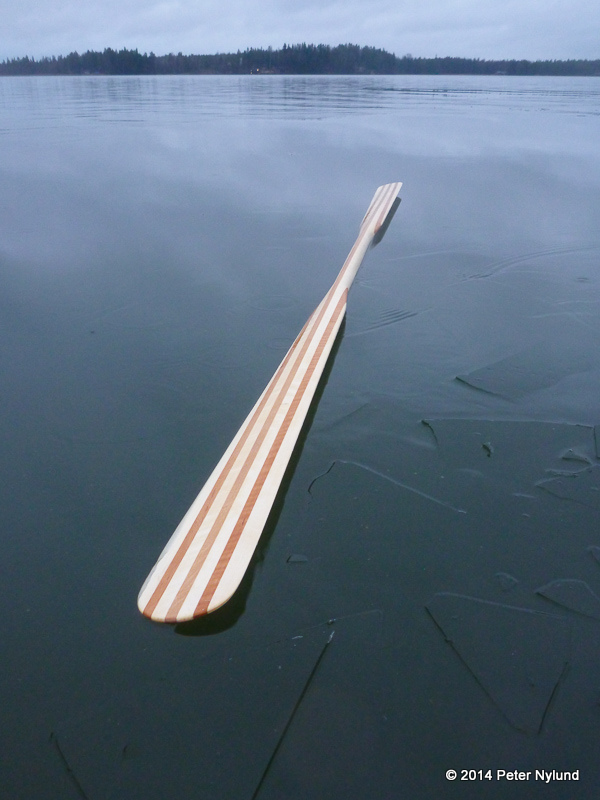 During a visit to the local shop Melontapiste, I noticed that Lahnakoski had a rather cheap Greenland paddle in my length (228 cm), so I bought it and started to use it. The technique with a Greenland paddle is a little different from that of a Euro paddle and the first strokes definitely felt a little unstable. The upper of the symmetric paddle has to be clearly angled forward to avoid wobbling, and at first this feels like it is pulling you down into the water. You adapt to this pretty quickly, though. The cadence is a little higher, but I had no problems keeping up a normal touring speed with it. In the beginning the top speed was a little lower, but I don't think that is the case any longer. 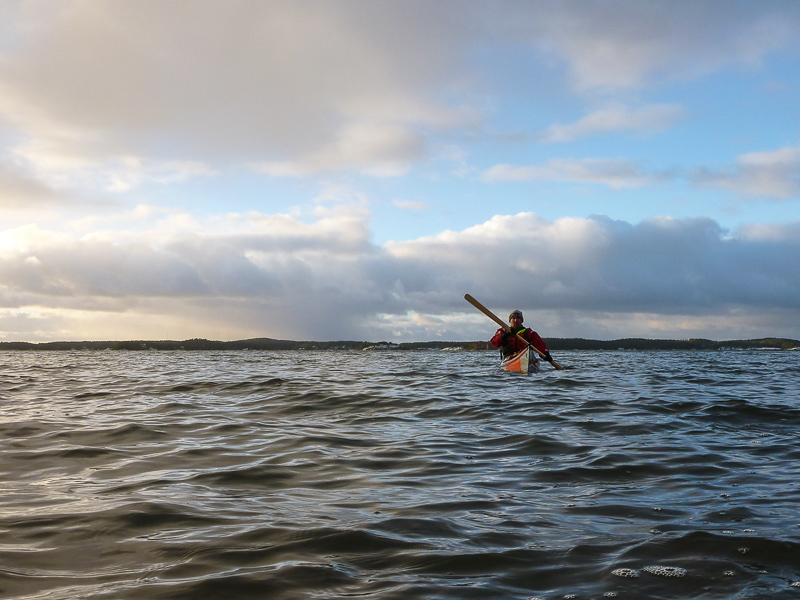 I didn't touch the ordinary paddle any longer, since I felt the Greenland paddle was so much more comfortable. With thick gloves it is still easy to feel the exact angle of the paddle, which is not the case with an ordinary paddle. The small discomfort I had felt in the right underarm with the Euro paddle disappeared quickly with the Greenland paddle and I do think it is a lot easier on the body. 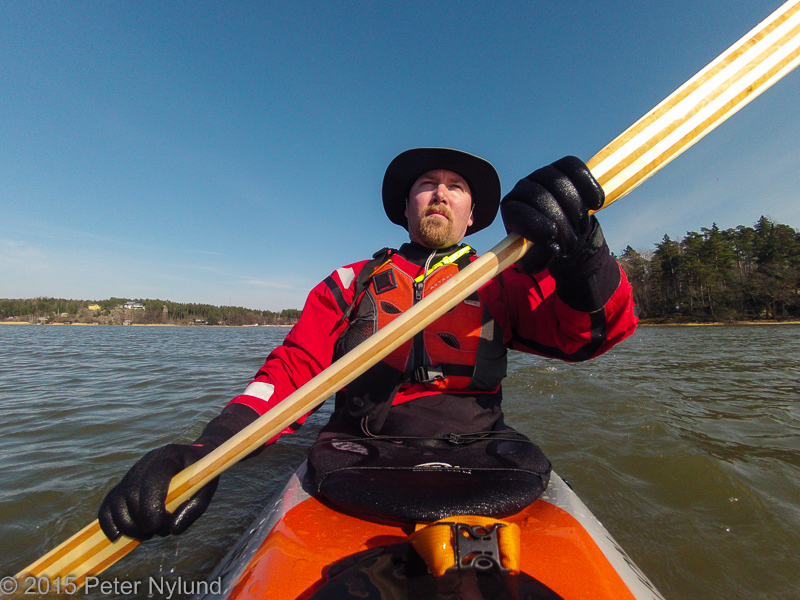 I also started to take the Greenland paddle to the indoor pool training. It basically is a little harder to roll with, since you cannot use brute force only, but on the other hand it then encourages better rolling technique. I trained using as little power power as possible, which didn't always succeed. 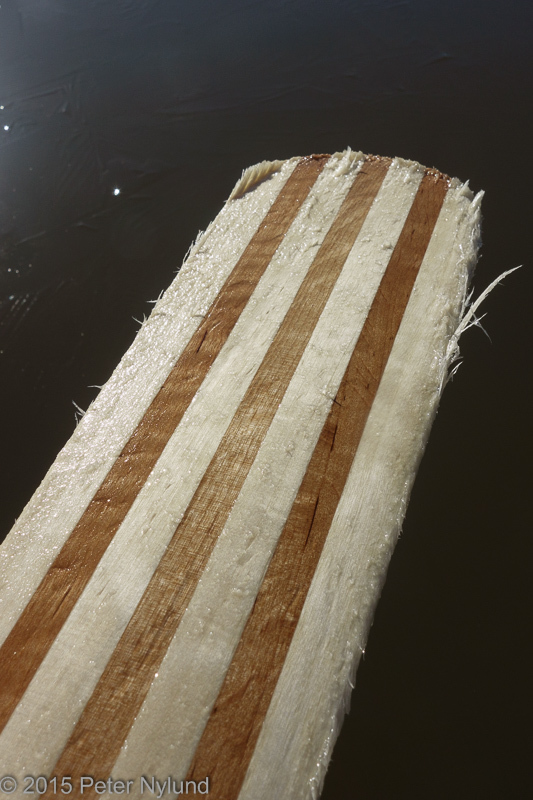 A Greenland paddle is however intended to be used in its full length and if a roll doesn't succeed at first using the ordinary grip, it is easy to switch grip to use a longer part of the paddle, after which a roll simply cannot fail. 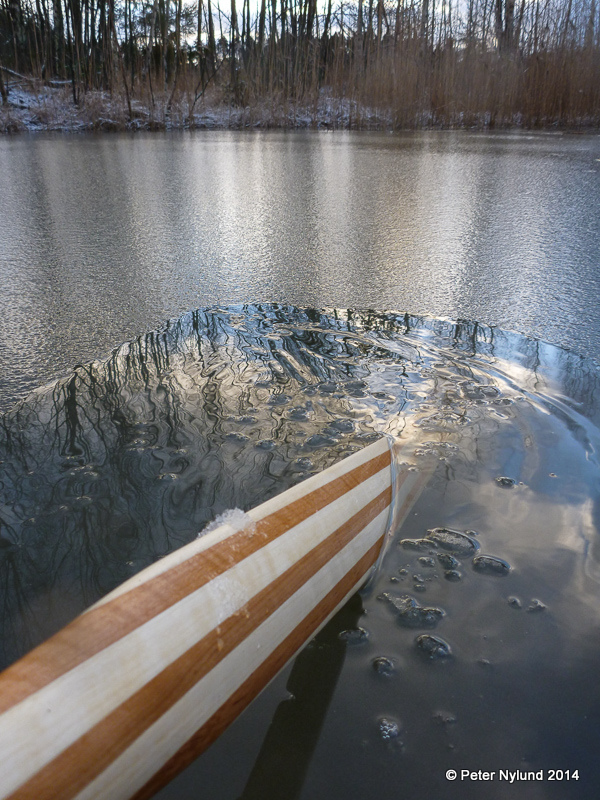 Generally, the smaller surface of a Greenland paddle makes bracing and maouvering techniques a little more difficult, since you cannot power your way through everything, but there is always the possibility to use better technique. The Greenland paddle does have a disadvantage in the winter, though. It doesn't really allow you to use pogies, which means that you have to find another way to keep the fingers warm. I didn't really find a satisfactory solution yet. The neoprene gloves were not watertight enough and especially in hard wind the fingers became quite cold. While tree is a really nice material for a Greenland paddle, it isn't really strong enough for use in the ice. Breaking ice takes its toll and after a kilometer of breaking ice that was 1 cm thick it looked like in the second picture. It took some work with the knife and sandpaper to get it back to shape again. I don't think a light carbon fibre paddle would be any better for this, though. The cheap Greenland paddle had one single disadvantage. It weighed over 1 kg, and while it might feel a little lighter, since the weight is in the middle and not out in the blades, 1 kg is still a lot. Lahnakoski happened to have the same paddle available in Red Cedar as well, and I had Melontapiste order one for me. It weighed 725 g, 300 g less than the other one, which really is a lot. The cost is the double, but in my opinion it is still not expensive. There are carbon fibre paddles weighing under 500 g, but they are quite expensive. 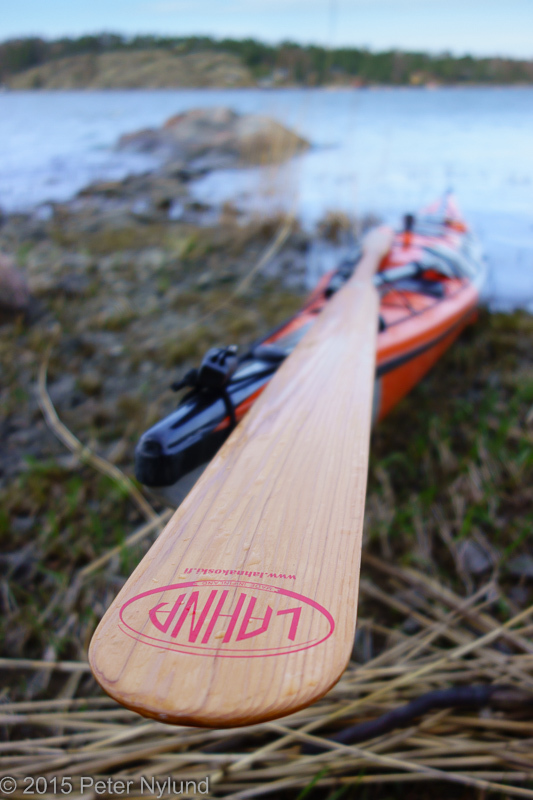 The Lahnakoski Greenland in Red Cedar is a beautiful paddle. I don't see myself switching away from Greenland paddles currently. As a spare paddle I'm still using a Euro paddle. I might make a Greenland storm paddle at some point, though. I've trained with one in the pool, but it would be interesting to try for real.